Unsatisfactory results following blepharoplasty or eyelid lift surgery require very specialized surgical techniques. 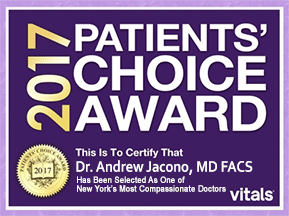 Doctor Jacono has extensive background and training in reconstructive eyelid surgery and specializes in revision blepharoplasty (eye lift). The delicate tissues of the eyelid are notoriously unforgiving in their response to overzealous surgery and revision blepharoplasty must be precise and delicate. While many flaws may resolve with time (3-6 months or more), more resistant difficulties may sometimes require further revision blepharoplasty surgery. There are too different types of revision eyelid surgery. One is to perform revision blepharoplasty for under correction where extra eyelid skin and bags are left behind, and the other is to perform revision eyelid lift surgery when too much skin and fat was removed creating an unnatural look where the eyes look sunken and change shape. Patient had prior surgery elsewhere. Doctor Jacono performed revision blepharoplasty for ptosis in the right eye (left side of the screen) after prior upper blepharoplasty surgery. Note how symmetry in the eyes is recreated. Revision Blepharoplasty Ectropion Repair Patient 2: The original blepharoplasty was performed elsewhere. Her eyes appeared rounded and pulled down(ectropion) and needed to be corrected. This patient underwent ectropion repair with lateral eyelid canthal surgery reestablishing her almond eyes. Under corrections (insufficient tissue removal) are generally more amenable to improvement. Doctor Jacono will usually need to redo the blepharoplasty, in upper and lower eyelid surgery this usually means removing excess skin and fat that were left behind. In lower eyelid surgery Dr. Jacono usually prefers to not remove excess fat from the lower eyelid but move it down into the hollows under the eyes which usually occur with age. This is called a fat transposition lower blepharoplasty. This must be performed precisely so that there is no problem closing the eyes after surgery (this is called lagopthlmos). Sometimes the upper eyelids look tired after an upper blepharoplasty not because the surgery needs to be revised, but because a droopy forehead and brow makes the eyelids look heavy and therefore an endoscopic browlift is necessary, not more eyelid surgery. Most overcorrections can be improved by techniques incorporating surface rearrangement and/or deep reinforcement. 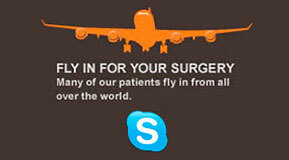 Severe tissue shortage or scarring may require extensive reconstructive surgery. In upper blepharoplasty sometimes too much skin is removed and the patient cannot close their eyes. 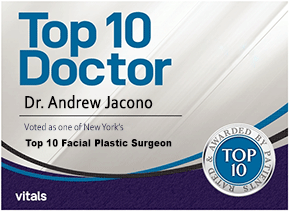 In this case Doctor Jacono must perform skin grafts to the upper eyelids. Other times after upper blepharoplasty is overdone the muscle that opens the eye called the levator muscle can be damaged or partially removed by being too aggressive. This is called ptosis and an operation called a ptosis repair where the muscle is reconstructed and tightened is performed. Revision Blepharoplasty Ectropion Repair Patient 3: The original blepharoplasty was performed elsewhere. Rounded pulled down eyes and hollowed look needed to be corrected. This patient underwent ectropion repair with lateral canthal surgery, midface lift and fat grafting to fix the shape of her eyes and the hollowness underneath the eyes from too much eyelid fat removal. Revision Blepharoplasty Ectropion Repair Patient 4: The original blepharoplasty was performed elsewhere. Rounded pulled down eyes needed to be corrected and sunken areas under the yes down to the cheeks needed to be corrected. This patient underwent ectropion repair with an endoscopic midface lift to support the eyes lift he cheeks and add volume under the eyes. The most common problem in lower blepharoplasty is ectropion, where the eyelid gets pulled down, and the shape of the eye becomes rounded and less almond shaped. This is why Kenny Rodgers eyes look so unusual after surgery. Doctor Jacono performs ectropion repairs with a variety of techniques including lateral canthal surgery which changes the lower eyelid tendons as well as endoscopic midface surgery which helps support the lower eyelids by lifting the cheeks. If too much fat is removed from the eyes a fat transfer or fat grafting from the abdomen to the under eye region is often necessary. Doctor Jacono has published in the Archives of Facial Plastic Surgery Journal on revision blepharoplasty for lower eyelid ectropion, (Click here to view his publications).